To apply sizes to a product, you must build and apply what's called a "Size Chart". 1) Select a Showroom and go to the Products page. icon on the top right hand corner of the page. 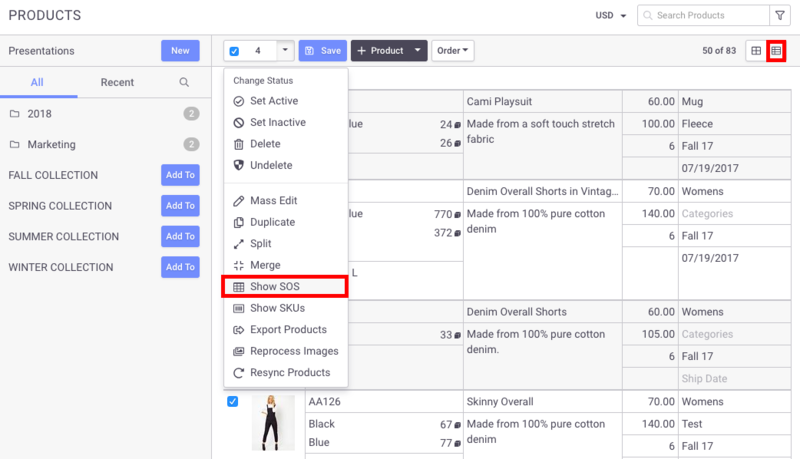 3) Select the product(s) you want to add/change a Size Chart by checking the box to the left of the product image. Then click on the product status drop down menu and select Show SOS and a window will pop up. 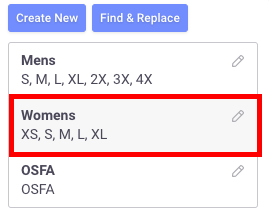 4) Select "Change sizes" to create a new Size Chart or apply an existing size chart to the products you selected. option. 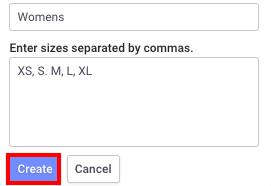 Enter a name for the Size Chart and the sizes below, each size separated by a comma. When the chart is complete, click Create. 6) To apply the Size Chart, select the Size Chart you just created. The sizes should then be applied to the products. Note: Sizes cannot be changed once the products are tied to an order. Please contact [email protected] to override size chart.